Are you tracking what activity drives conversions on your WordPress site? You’re working hard to drive traffic to your website. Social media posts are going live. Blog posts are being shared. Email newsletters are getting sent out. You’re appearing higher on Google search results. From the look of the upward trend in web traffic, the hard work is paying off! There’s one problem. Increasing web traffic is on the up. But, sales aren’t. Maybe you’re thinking about spending more money on Google ads, or hiring a PR agency. But, have you considered looking closer to home? If you’re getting good traffic, but this is not translating into increased sales; optimising your web pages is the likely solution. Setting up Google Conversion Goals is the first step to solving this problem. We take on the task of identifying key activities that drive revenue on your website. Then we set up tracking to record exactly how visitors are interacting with particular pages, content, calls to action and more. We deliver this service in just 2 days, guaranteed. This saves you time and ensures you get accurate insights you can use immediately. If you feel up to taking on the challenge yourself, here’s a breakdown of the process step by step. 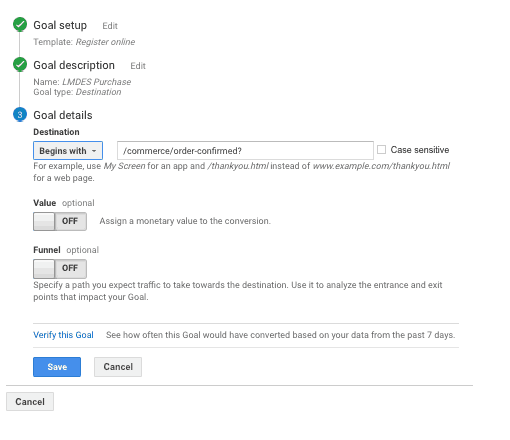 How can you setup Conversion Goals in Google Analytics? Here’s a quick overview of the key steps you will need to follow. 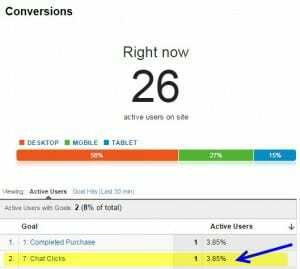 Why Google Conversion Goals matter. You can know what is working and what isn’t. Whether it is a landing page or an ad on Facebook, by tracking conversion you can see what is converting or what isn’t and make changes accordingly. You can improve your return on investment (ROI) without increasing your marketing budget. Perhaps you’re getting lots of web traffic but surprisingly low conversions. By optimizing your website content based on conversion data you can drive costs down while improving your ROI. A/B Testing: Conversion tracking allows you setup experiments and try different types of page layouts and web content for your business. Different variables to optimise for include increased clicks, conversions, and leads. A/B testing even the smallest things on landing pages and your website, such as a green button vs a red button, can affect your conversion rate. 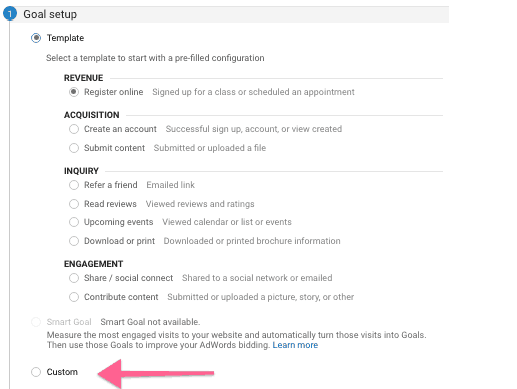 Goals in Google Analytics allow you to track specific user interactions on a website. These user interactions can be anything from form submissions and button clicks to ebook downloads, and more. When a website visitor performs the action you’ve defined as a goal, Analytics records it as a ‘conversion’. Conversion Rate Optimisation (CRO) describes the process of how to improve website performance to boost sales. Put simply, conversion rate optimisation is finding out why visitors aren’t buying and fixing it. The primary copy, button, link or UI (user interface) element that asks the web visitor to take action towards conversion (e.g. Sign Up, Download Now, Buy Now). A key performance indicator, refers to what you will measure know if you’ve reached success or not. For example e.g. increased number of sales, consultation bookings, downloads, subscribers. You should prioritise primary goals that impact the client’s revenue. The Conversion Funnel is a way to outline the journey a web user takes from potential customer to paying customer. You can use different tactics at the top, middle and bottom of the funnel to pull customers through. The percentage of people who leave after viewing a single page. High bounce rates on website or high exits rates on a specific page usually present an opportunity to optimise conversions. A look at your client’s website will give you a good idea of what web activities can count as goals. 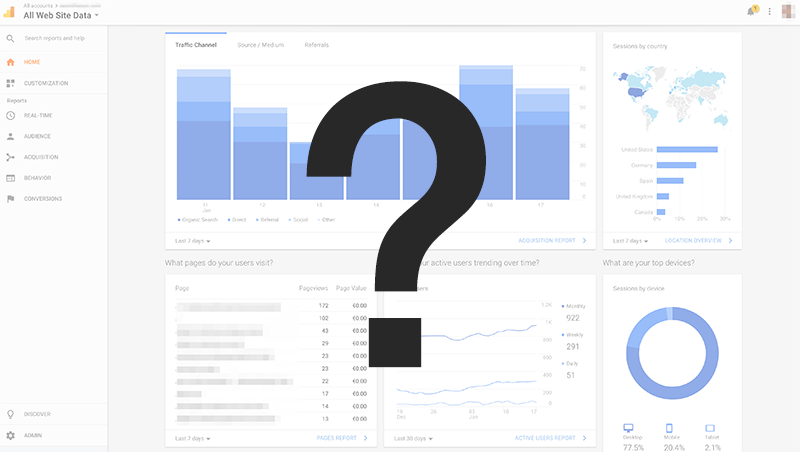 Go to the Google Analytics dashboard. Click on Admin in the lower bottom left-hand column. There are 3 columns Account > Property > View. Go to View and click on ‘Goals’. 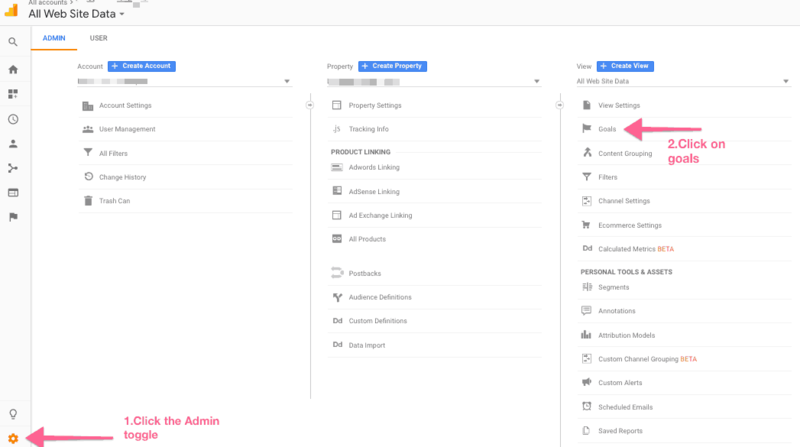 Click +New Goal (Ensure you have the right admin permissions. You need to request ‘Edit’ permissions from your client. Acquisition = Content site where the goal is to gain more subscribers. Inquiry = Booking a consultation call or seeking further information via other collateral e.g. brochure download. Engagement = Watching an explainer video, sharing or commenting on a blog post. If none of the templates fit your needs, there is also the option to set up custom goals. Select the goal template that makes most sense for your client’s highest priority and complete the template putting in the URL of the destination page.If none of the templates fit your needs, there is also the option to set up custom goals. In the example above the the ‘revenue’ goal category has been selected. The page URL of the product order confirmation page has been selected as the goal destination. If your objective is acquisition (product orders, brochure downloads, new subscribers etc…) then you will need to enter the URL of final landing page that will trigger the confirmation that the goal has been reached. For ‘Match Type’, the most common selection is ‘Begins with’. This will capture anything that follows the URL, including unique order numbers. Exact match is when your final; destination URL doesn’t change. ‘Regular expression’ is a more complicated, advanced option, it allows you to define your URL. ‘Goal value’ is most commonly used to define the worth of leads generated by website actions e.g: document downloads, webinar sign ups, newsletter subscribers. You can calculate goal value by defining the total revenue that comes in via the selected channel and dividing this by total number of leads. For example: Imagine you have an email newsletter and receive 100 new sign ups within a month. The average monthly revenue from the newsletter is £10,000 in sales each month. This means that the goal value for a new sign up is £100. (Goal values will vary depending on the tracked activity and average revenue. Be sure to keep them updated for accuracy). Goal funnels allow you to see how visitors move through each step of the conversion process. You can build a funnel with up to 10 steps. The benefit is that it allows you to improve specific steps / pages where visitors drop off. This only works if there are a fixed series of steps a web visitor must go through to complete a purchase or any other goal. Otherwise the ‘Visitor flow’ view provides a good overview of how web visitors navigate your client’s site. To set up the goal funnel, identify each step of the action series you’re tracking. If you want to ensure Google Analytics counts only those who start at the first step, click the required toggle. Then just put in every step of the funnel with the name of the step + the ending URL parameter of the specific page. This means everything after the “/” in the pageURL. This metric is similar to visit duration. It tracks how many pages of your website the visitor looks at before they leave. It’s useful to see how much content is being consumed before the visitor leaves. Just set the minimum number of pages you want to record. Event tracking in Google Goals is designed to capture all of the non-pageview actions that you might be interested in on the website. Before you can track events goals you need to capture the activity. This requires the addition of code to the page (same as with pageview URL hack). This is easily achieved using a wordpress plugin like Yoast, or Universal Google Analytics or signing up to Google Tag Manager. The initial questions to ask yourself when setting up events is: What are we tracking? You do not need to complete very category, you can use just one or all. Alternatively you can use just one label that describes the event as in the ‘Alt Label Choices’ above. Just make sure the labelling structure is consistent for easy reporting. 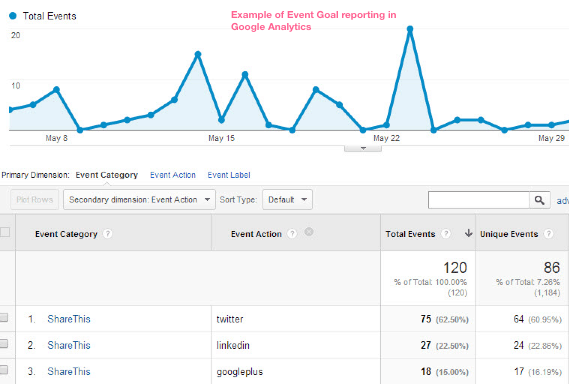 To see the events created in Google Analytics go ‘Behaviour’ on the left-hand and scroll down to the Events > Overview. 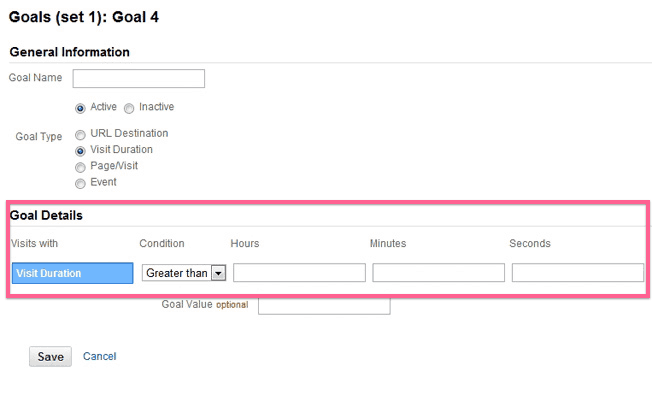 Once you have completed goal setup, you can test your goals are tracking correctly in real time. Carry out the action belonging to your Goal conversion e.g. ‘product order’ or ‘chatbox click’. Go to ‘Real Time’ in the left-hand column and then to ‘Conversions’. You should be able to see data come through in this view. If you are not seeing results, go back and check your goal setup. Common errors include choosing the wrong ‘Match type’ for your destination URL or incorrect categories for Event Goals. Decide which conversion template to use: revenue, acquisition, inquiry or engagement based on the highest priority of the website. If going with the most popular goal type, ‘Destination URL’, enter the page url of the specific action that will confirm the goal has been reached. Define the average goal value for the website or selected channel based on the formula (goal value = total average leads / total average revenue). Build your goal funnel based on the series of steps web visitors need to pass through to achieve a goal. Once you have completed goal setup, you can test your goals are tracking correctly by triggering the activity and viewing data collected in the ‘Real Time’ reporting view . By following these steps you will have a clear view of what activity is triggering conversions on the site. The next step will be to look at the reporting data and discover opportunities to improve conversion rates. Depending on how much traffic your site achieves you may see valuable data in 1 week or it could take longer. We provide a guide on how to interpret and evaluate your conversion goal reporting alongside our setup service. If you want to save time and ensure tracking accurate set up and valid data, you can order the Google Conversion Goal Setup service directly from us and have it completed in 2 days. Guaranteed. You know that you need to understand conversion analytics but you hate the idea of setting up the whole thing? Keep calm and let us take care of that. 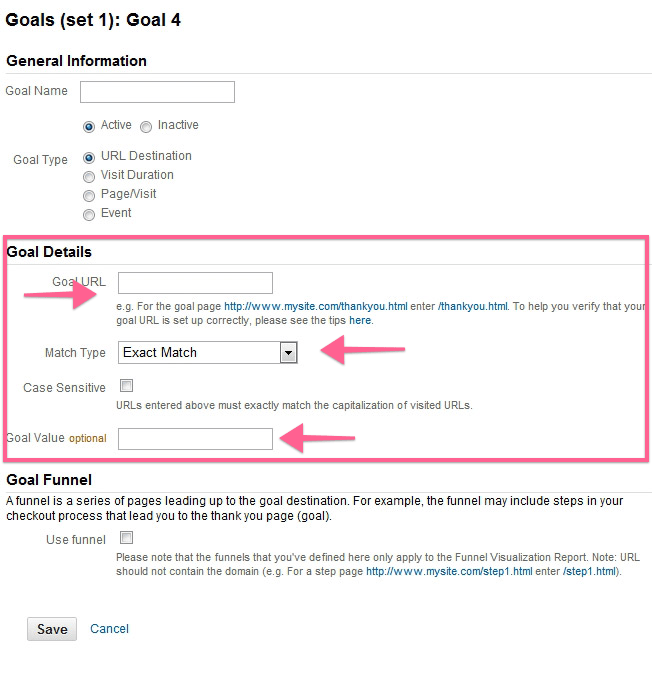 Let us know up to 5 goals you want to track, or we’ll review your site and complete the setup on your behalf.